Welcome to Be Back Whenever where Mark and Susan blog about their continuing travels adventures, including the Around the World 9 month trip! Being from Fort Collins, CO – home to about 23 microbreweries – we like to check out microbreweries around the world and we’re keeping track of the ones we visit on the Microbrewery and Beers page. Check it out – updated May 8, 2018. This page has info on all the beer we tried around the world. Is this why people wonder why our pictures always have a beer in hand?? Check out 2018 Fall signs we find along the way. These are updated as on September 2018. We take pictures of interesting/confusing/amusing ones as we go. Mark’s sister, Julia, wanted to go to Ireland over her Spring Break and asked us to be her guides. Fast forward to March 15, 2019 and we met Julia at Dublin airport and started her adventure. I promised to post a few pictures and have done that in the blog. I’ll update the whole story later here – think blizzard in Colorado! It’s winter so it must be time to head off to Maui for a month! We’re in Maui and hope it’s an uneventful trip and we have a hard time finding stories to put in the blog! We’ll be back in Fort Collins March 2, just in time to wash the beach clothes, put them away, find cold weather clothes and head off to Ireland for a few weeks with Mark’s sister Julia. Maybe some good stories there! Check the blog where I posted a few Maui pics. BTW … packing for a month of Hawaii weather is WAY easier than packing for Around the World! Off we go again – August 2018! We’ve been home for about 3 months now so it must be time to take another trip! We’re off in August for a cruise to Alaska with a land tour added on to Denali. After a stop to visit Mom, we head off to Europe for about 2 months – Norway, Sweden, Helsinki, Tallinn, Riga, Krakow, Munich for Oktoberfest, a few weeks in Malta, and two weeks of cat sitting in Geneva. I’m sure we’ll hit a few microbreweries along the way in between museums and churches and markets. We’ll blog as we go so check out the blogs for our tales of travels! The packing was WAY easier this time! We’re including the planning, frustrations, great companies (or not so great companies) and products we’re using on this trip. We’re also answering questions from friends and family about how to plan/pack/navigate a trip for 9-12 months. You can check out our schedule for the trip and the statistics of the trip. We blogged along the way, too, with the tales of our travels! After 63 different hotels and apartments; 17 countries (18 if you count the Istanbul airport); 31 different flights; 11 different trains; 5 ferry rides; and 262 days, we made it home! It’s July 9 and we’ve been home 52 days. It seems as if we were never gone. 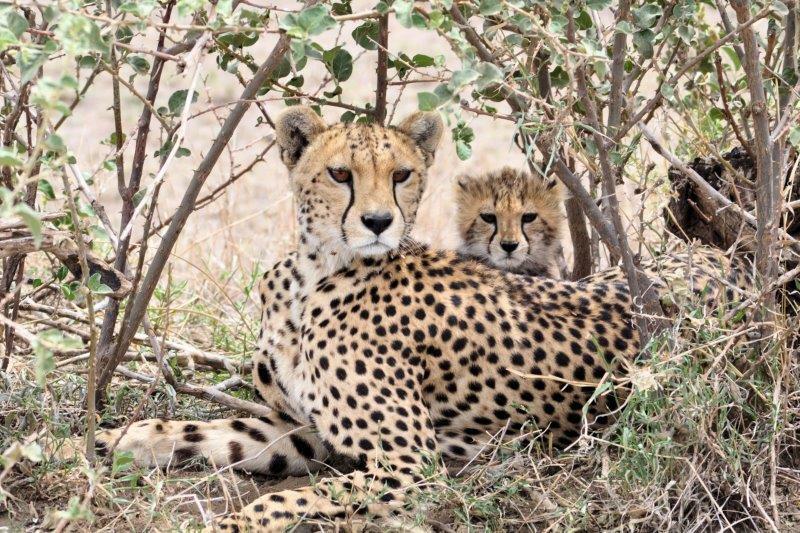 Momma cheetah and her cub just looking at us.